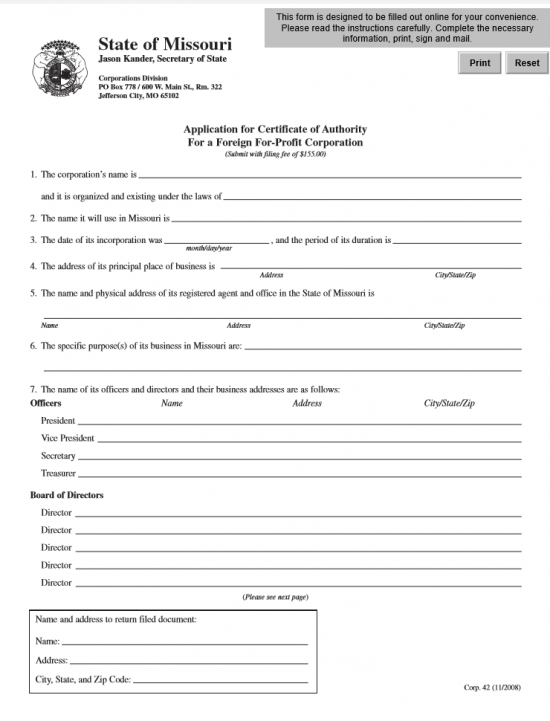 The Missouri Application for Certificate of Authority To Do Business in Missouri | Form Corp 42 will need to be submitted to the Missouri Secretary of State prior to transacting business as a corporation in this State. That is, in order for a foreign corporation to act as such, it must first gain a Certificate of Authority To Do Business In Missouri before it may be legally allowed to. 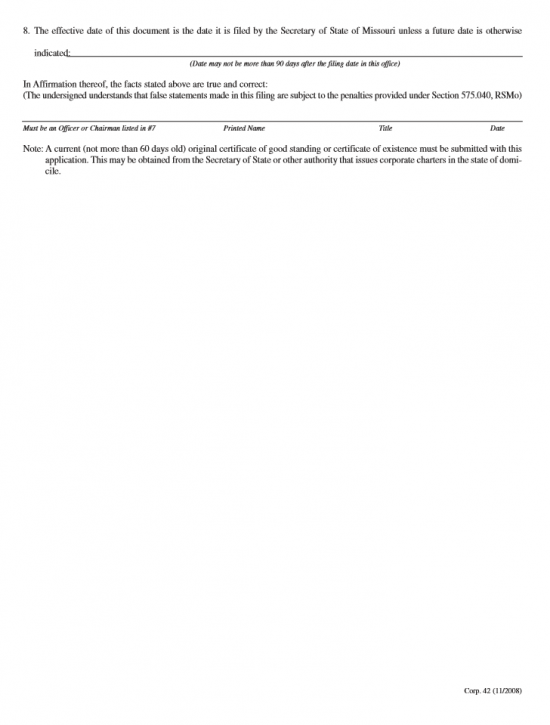 The term transacting business is defined in Section 351.572 RSMo. Keep in mind that even if your actions to not fall under the category of Transacting Business, your corporation may need to satisfy other requirements. It is also worth mentioning that a corporation will also need to make sure that all documents that must be submitted for its entity type be filed simultaneously with this application. All foreign corporations will need to submit a Certificate of Good Standing from the Secretary of State in the filing entity’s parent state. Regardless of the type of forprofit corporation the filing entity wishes to operate as, the $155.00 Filing Fee must be paid for in order for the application to be processed. If filing online, you may pay by credit card however, if filing my mail, you must pay with a check (made out to Director of Revenue). If filing by mail, you may send this application to Secretary of State, Corporations Division, P.O. Box 778/600 W Main Street, Room 322, Jefferson City, MO 65102 or you may login at https://bsd.sos.mo.gov/LoginWelcome.aspx?lobID=1&ReturnURL=~/BusinessEntity/NewBEFiling.aspx?beID=3175573%26FilingTypeID%3d1844 in order to file electronically. Step 1 - Download the Application by selecting the link above or by clicking here: Form Corp 42. Step 2 - In Item 1, on the first blank line, report the Full Name of the Corporation as it is written on the Certificate of Existence including any nuances such as punctuation, abbreviations, and spellings. Step 3 - In Item 2, on the second blank line, report the jurisdiction where this corporation achieved its corporate status. That is, the parent state of the filing entity. Step 4 - In Item 3, report the Date of Incorporation when this entity first achieved its corporation status on the first blank line. If it intends to operate for a finite amount of time, then enter the number of years remaining in its lifespan on the second blank line. If this corporation shall operate indefinitely, write in the word “Perpetual” on the second blank line. Step 5 - In Item 4, report the Full Address of the Principal Office or the Principal Place of Business for the filing entity. Step 6 - Each corporate entity in this state must operate with a Registered Agent who may receive service of process. This may not be the filing entity. Report the Full Name and Address of the Registered Agent for the filing entity in Item 5. Step 7 - In Item 6, describe the Purpose of the corporation’s business in the State of Missouri. Step 8 - In Item 7, you will need to provide a Full Roster of the Officers and Board of Directors serving the filing entity. There will be a line for the President, Vice President, Secretary, and Treasurer in the Officers section. There will be enough lines to report five Directors in the “Board of Directors” section. Each section will require the Full Name and Full Address for each party being reported. Step 9 - The bottom of this page will contain a box where you must document where the Missouri Secretary of State may send the Certificate of Authority or return these articles for correction. This must contain a Recipient’s Name and Address and must be up to date. Step 10 - Sometimes, it is necessary to separate the Filing Date from the Effective Date of a successful filing. If this is the case, you may report this desired Date of Effect on the blank line in Item 8. This must be within 90 days of the filing date. If you wish the Effective Date to be on a successful Filing Date, then you may leave this line blank. Step 11 - Next, an authorized Officer or Chairman (from Item 7) must Sign his/her Name, Print his/her Name, provide his/her Title, and document the Date of Signing on the last blank line of this application. Step 12 - Attach all accompanying paperwork, including an original Certificate of Good Standing (less than 60 days old) to the Missouri Application for Certificate of Authority for a Foreign For-Profit Corporation. Step 13 - Send your package with a check made payable to “Director of Revenue” in the amount of $155.00 (Filing Fee) to the Missouri Secretary of State.